Cars of the 1980s are becoming more and more collectable. 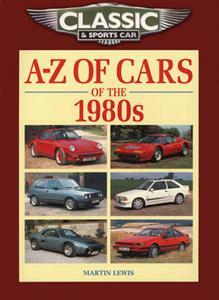 Those needing encyclopaedic information on cars of that decade need look no further. This book contains brief histories of all the manufacturers who sold cars in Britain during the period. Some 650 cars are illustrated and described in alphabetical order, by manufacturer (including many doomed enterprises). There are comprehensive notes on each model's production dates and numbers, recognition features, variants, strengths and weaknesses.